Going out for drinks is great fun and most of us have a few legendary nights out that we can remember being great occasions and tons of fun (or maybe we can’t remember that and we’re just going on what other people say). So if that’s the case then, why is it that the very next day so many people swear that they’re never going out, and never drinking ever again? Well that would be a little something called a hangover – a term that most of us are all too familiar with unfortunately and that can very nearly make nights out not worth it. A hangover after a good night out can leave us with a splitting headache, a dry and hoarse throat and a queasy feeling that means we’re likely to be sick any minute – not ideal. Of all this possibly the worst part of this is the headache which makes it difficult to even think, and which sees us wearing shades indoors and wincing every time someone raises their voice even a little. What Causes a Hangover Headache? This headache is caused mainly by simple dehydration. Because alcohol causes increased urination (diuresis) and blocks the signal to the brain telling us we’re thirsty, that results in dehydration which starves the brain of H2O. Meanwhile this also causes our brain’s blood vessels to expand causing low blood pressure and more headache. Meanwhile the urination results in a reduction in the number of vitamins and minerals in our blood stream which again leaves our brain without the electrolytes it needs for communication between synapses etc. So then with this in mind, the best way to cure a hangover headache is of course to try and replenish that water and those minerals and thereby help the brain to recover. That means that what you don’t want is a nice cup of coffee. Although coffee can help you to sober up when drunk by improving brain function, it actually is one of the worst things you can drink when attempting to recover from dehydration induced headache – simply because it actually causes dehydration itself. 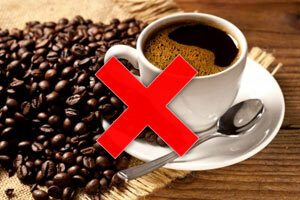 So steer away from the caffeine for now unless you have a headache that is partly caused by a lack of caffeine, then you should steer clear for now. One thing that caffeine has going for it for curing headaches is that it is a vasoconstrictor meaning that it can narrow those blood vessels again in the brain. However it is possible to get this effect without having to consume caffeine and you can achieve the same effect by consuming sodium – also known as good old salt. Other vasoconstrictors are ginger and liquorice, so consider these in your post drinking meals. Salt is also good for other things – because it is an electrolyte which is used to let our neurons communicate. When were very dehydrated we have normally lost a lot of salt in our urine and sweat and drinking lots more water without replacing some of that sodium is a sure fire way to end up with an electrolyte imbalance. 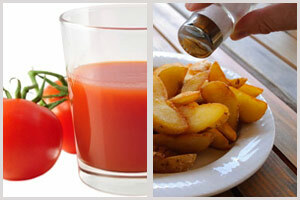 Solve the problem by eating a nice salty meal – such as a fry up. At the same time by eating carbs in the form of potato and bread that will come with that fry up, you will be able to increase your energy levels as no doubt you are currently feeling rather lethargic. Another cause of the brain ache you’re feeling right now is a lack of vitamins and minerals – all of which have been lost in your urine. You can solve this problem by drinking a nice glass of juice with your meal. Be careful though – if you have stomach ache or have been sick then your stomach lining may be susceptible to acidic drinks like orange juice – so perhaps try a tomato juice instead. Meanwhile you should make sure to get as much sleep as you can – and lying down somewhere dark with your eyes closed is probably the best thing you can do for a hangover headache. Avoid loud noises, and take an analgesic. Avoid ibuprofen though or aspirin as these are not only harder on the stomach, but also blood thinning in nature meaning that they will further decrease your blood pressure which can be a bad combination with vasodilation. Take coffee with honey as the glucose in honey gets absorbed quickly than sugar. This article saved my life!